This Lisna Waters LWW1 model by is a 1350mm x 800mm whirlpool bath shower with a Black glass interior back wall and 5mm clear glass sides and doors. The reinforced bath base has an integrated molded seat and has a sturdy steel frame underneath with an encapsulated base board. 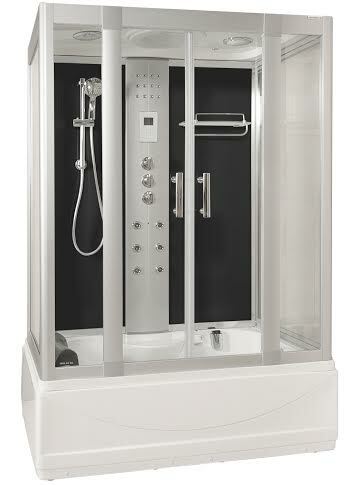 This model has a designer stainless steel top rain shower, removable hand shower on a riser rail and 6 adjustable back jets. The 3-dial shower valve has the popular Vernet wax sensor and the robost 3kw steam generator, is complimented by a chrome steam pod that permits aromatherapy use. The LWW1 has a stylish chrome shower frame and chrome bath filler, with 7 colour changing underwater lights, chromotherapy lighting and LED control tower lights. With a touch screen control pad, plus a FM radio with Bluetooth connectivity and of course the Elegance Easy Clean Protection, this all makes this Lisna Waters whirlpool steam shower an excellent value purchase.